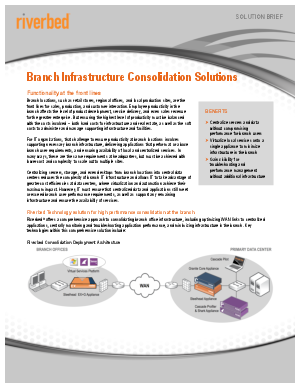 Riverbed Technology branch consolidation solution enables organizations to streamline branch office infrastructure with a powerful, multi-functional appliance. Riverbed® products offers a comprehensive approach to consolidating branch office infrastructure, including optimizing WAN links to centralized applications, centrally monitoring and troubleshooting application performance, and minimizing infrastructure in the branch. The benefits centralization without compromising performance, branch office box for streamlined branch infrastructure, visibility to the edge.